The Kverneland 852 mounted bale chopper is specially designed for working with straw for bedding purposes. The 2m3 chamber offers fast and easy loading of bales and the rear door offers the possibility to carry an extra bale for improved efficiency. The Kverneland 852 is fitted standard with a swivelling chute for accurate direct bedding. Standard fitted with swivelling chute for accurate bedding. Able to discharge the straw at a distance of up to 20m. The working heart of the 852 is the combination of drum, comb & flywheel – all specifically designed to shred straw bales in all formats. The drum is fitted with spirals of blades and small ‘gripper’ teeth, which take the straw from the bale and feed it evenly into the flywheel chamber. The flywheel can discharge the straw via the 280° swivelling chute at distances up to 15 metres - even feed of the straw onto the flywheel reduces blockage risk and maintains tractor power needed at a minimum level. The Kverneland 852 is fitted as standard with a new swivel chute that offers a 280° rotation of the chute. It allows the operator to accurately direct bedding materials into otherwise inaccessible areas of the building. This give a more efficient distribution of the material and reduces the risk of blockages. The end flap of the swivel chute operates via an electric actuator whilst the 280° rotation of the chute is hydraulically operated. 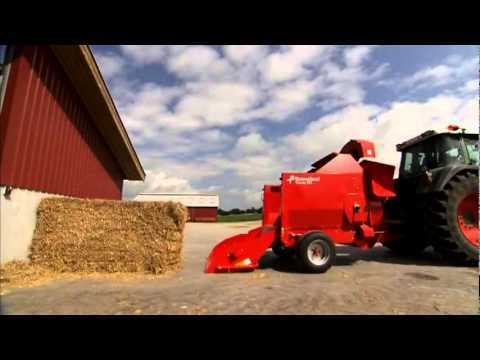 The Kverneland 852 can discharge the straw at a distance of up to 15m.